Wooden wares. Juan Luna St., Binondo, Manila. 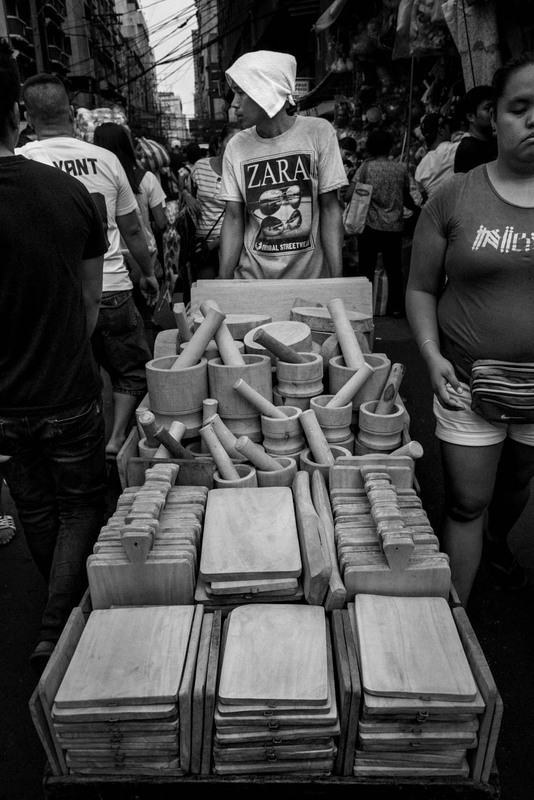 Walking through the crowded Juan Luna street in Binondo, I found myself smack, right in front of this person pushing a cart full of wooden kitchenwares. I was fortunate to have my 28mm on my camera or else I would’ve had to crouch or probably missed this shot. Choosing the 28mm over the 50mm was a good move, and I managed to get a lot of keepers from this Saturday walk in Binondo. This image was just one snap, with me holding the camera with my right hand in a slightly downward direction. My friends have noticed that I have this weird way of composing from the hip or chest, using my gut as reference. So, I took one shot and smiled, though he didn’t actually see me, and then walked away. And no, I didn’t chimp, my LCD has been switched off and I just checked the image as soon as I got to the nearest coffeeshop which was a few blocks away. This Minolta MD W.Rokkor-X 28mm 1:2.8 seems sharp enough and probably even better than other modern but cheap and plasticky 28mm lenses. It’s good for my everyday shooting and works really well on crowded streets. See flickr for EXIF. Originally posted on my Instagram. Filed under Street Photography. Tagged as 28mm, Binondo, Chinatown, Juan Luna St, Minolta, Rokkor, Sony A7SII, Street Photography, Streets of Manila.